Presents the most real architectural value of the buildings of the Qutub Shahi period. 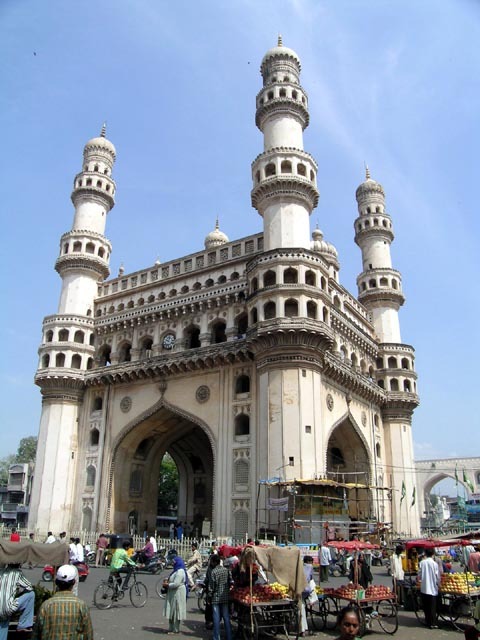 Built in A.D. 1591 in Hyderabad. The Char Minar is a triumphal archway, built for a purpose similar to the Teen Darwaza in Ahmedabad. It is a square in plan and measures 100' side. The minars, one in each corner are 186' high. The ground storey consists of large archways on each side, each having a span of 36'. Above the arches, the upper storeys show first a triforium, surmounted by a smaller arcade and a perforated balustrade above. The building displays the showily attractive character of the buildings of this period and style and a superfluous application of detail.